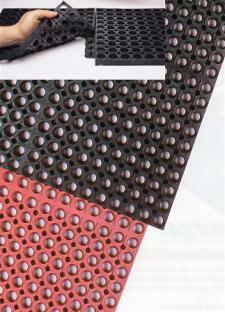 Anti-fatigue mats can help prevent pain. Foot pain can be debilitating for both sedentary and active people, causing many require rest. But what happens if your job requires you to be on your feet for most of the day? Anti-fatigue mats can help provide extra cushion to the joints, taking away pressure and keeping feet comfortable while on the job. However, there are some other exercises you can do to keep your feet healthy, even when you’re struck with pain. According to Medical News Bulletin, one of the most common reasons for foot pain is plantar fasciitis, which can feel like sharp pains in the heel while walking due to inflammation in the thick connective tissue of plantar fascia. The news provider reports being on your feet for the majority of the day can put you at major risk for this malady. Web MD reports that plantar fasciitis can be treated with medication, resting the pain area and icing it every so often. However, if it doesn’t improve over time with that regimen, the source reports physical therapy may be required. If you are experiencing pain, try and speak to your manager to see if you can get relief from your feet for a few days.